Our single speed high powered range of auger drives have been designed to handle higher machine hydraulic pressures to deliver more power at higher RPM to suit drilling applications on 15 to 30 tonne machines. Fitted with a high efficiency radial piston motor and integrated input housing, these drives will help you increase productivity and reduce downtime to optimise your returns. 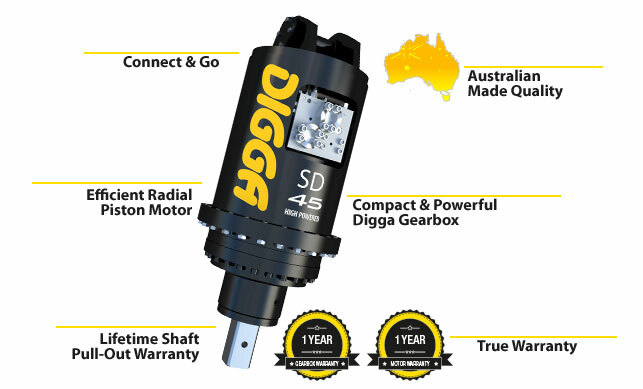 Digga have been designing and manufacturing drilling gearboxes for over 30 years. Unlike others who have to adapt to off-the-shelf componentry for their gearboxes, we design every component for its intended purpose, resulting in a much more compact and powerful drive. A highly reliable motor high in power yet low in maintenance, delivering faster drilling speeds at high torque. No need to sacrifice speed for torque or torque for speed. A two-piece shaft design isolates the planetary gears from excessive side load. Oversized thrust washer and lock nuts secure the shaft. This promotes easy seal changes and servicing. Our shaft design prevents the shaft from falling out, even under continuous use. Digga drive units are made right here in Australia from quality materials. Digga is a proud Australian manufacturer committed to keeping jobs in the country.